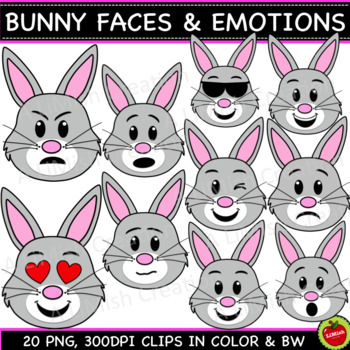 This super cute bunny faces clipart set has 20 images, 10 color and 10 black and white versions of the color clips. All images are saved as 300dpi, png files, making it easy to resize or print without losing clarity. Our clipart may be used for commercial purposes. All we ask in return is that you please give credit to our store somewhere within your product. TOU included in download and may also be downloaded for free from our store. ⭐ Lifetime Clip Art Growing Bundle. Images, backgrounds, frames, labels, borders! • Once logged in to your TpT account, go to your My Purchases page. • Beside each item purchased you'll see a Provide Feedback button. • Click on it and you will be taken to a page where you can give a quick rating and leave a short comment for the product. • Click the green star next to my store logo to become a follower. • You will receive future email updates about my store. 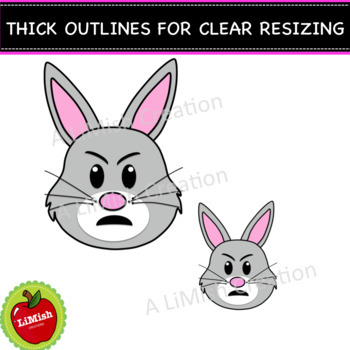 KEYWORDS: bunny clipart, bunny clip art, bunny faces clipart, bunny faces clip art, bunny emotions clipart, bunny emotions clip art.